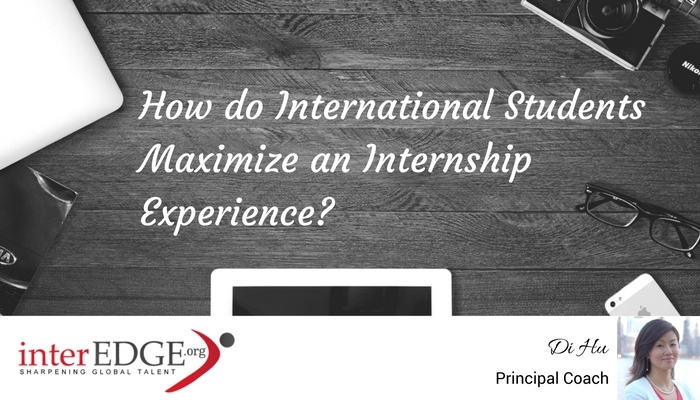 How do International Students Maximize an Internship Experience? I met Xiaoying at a cafe in midtown at the end of her workday. One month into her internship at CitiBank, she was seen working very hard and has been doing well in all the projects she was assigned to assist. When I asked her about her colleagues, she had very little to say beyond the usual. “They are very nice,” “John is very funny,” and “Beth can be competitive sometimes.” When I asked her about the other departments, she barely had anything to say other than those belonging to the same floor she was in. “I will work hard and try my best to impress my manager. I will finish the internship in two months and go back to school in September.” Xiaoying responded as she looked down. This is the process many international students take – they apply, join the interview, complete the internship, and lastly, add it to their resume. This is the obvious pattern and the alleged easiest, the most convenient plan; but there is another plan – a better plan, in fact. Take a generalist learning approach while sharpening your specialist skills. Over the years, the workplace became more collaborative than ever – and it will continue doing so. Understanding the goals, strategies, concerns, and glitches from the perspective of another department not only helps you become better at what you are doing, but it will also equip you with a more in-depth understanding of how a corporation or operation works. These reflections will add credibility to your profile during your next potential interview. Learning from your senior colleagues will happen naturally during an internship. Select one or two of them and intentionally build a mentor-mentee relationship with them. However, you must keep in mind that the interest needs to be mutual. Don’t be pushy and don’t be discreet either. Furthermore, you must not be manipulative and plan to comprise with him or her if needed. When the relationship is established, remember to always be genuinely interested in learning from them. You may suggest two of you meet for 15 minutes a week or even 30 minutes every other week. Research shows that the more someone invests in your growth, the more eager they are to see you succeed and the more willing they are to help you. Your internship will almost guarantee you success in scheduling coffee or lunch meetings with your colleagues. This is because they consider you a colleague of theirs at the moment. Have a plan to meet at least one or two different people every week so you can build the relationship. What you will learn from them may exceed your expectations. Is there a big deadline coming up? Is there a crisis happening? Is one of your colleagues on leave? These are all your opportunities. Lean in and offer to work a few extra hours on evenings or during the weekend. If you see others needing help, assist them so they could meet their targets or deadlines. In return, others will also learn to consider your situation and furthermore, would sincerely reciprocate the same deed in the future. Don’t underestimate the spotlight you may receive if you do something new. It may be having ideas such as starting a company Twitter account, organizing a volunteer experience, or doing an international potluck. If it is something that has never been done before in the company, it will be talked about, and it will get noticed. If it is work related, make sure to check with your supervisor and get approval first. If it is a social event, talk to a few colleagues to test the interest level first. What else do you do to optimize your internship experience? Share with us in the comments area.